Is the concept of “spatial aspect” attested in any natural language? As described here, Aspect refers to the grammatical marking of the relation between topic and eventuality time, that is, it marking in what way the time an action actually occurs relates to the time currently being talked about. So in the sentence “Before returning home, he had gone shopping”, the topic time would be the moment of arriving home, and the eventuality time the time of going shopping, and the English past perfect marks that the latter happened before the former. A logical extension of this system then would be to not only mark for differences in topic and eventuality time, but also topic and eventuality space. In the above sentence, the topic space (or location) would be the home, while the location of the shopping would be the eventuality space. The sentence might then mark for the fact that the shopping center is far away from the home, as opposed to (for example), inside the home. Further distinctions could be made with regards to motion: shopping is fairly stationary, but in “To get home, he had to drive on the highway”, there is clear motion towards the topic space and this too might be marked. 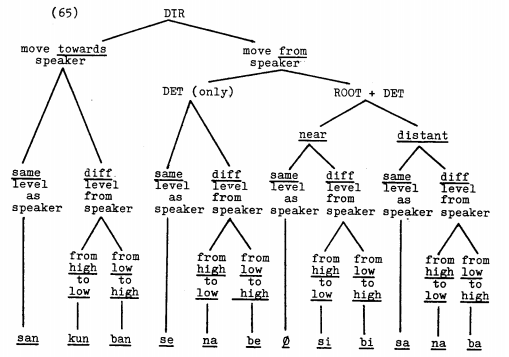 So I am curious, does anything along these lines exist in natural languages? The closest thing I was able to find were cis- and translocative markers in some languages, but the examples don’t really make it clear that this is used in a mandatory inflectional manner the same way temporal aspect is in many language. I don't know of any languages where spatial marking is thoroughly compulsory in the same way aspect often is, however I do know of some potentially interesting cases of spatial marking. A lot of Papuan languages have grammaticalised systems for showing directionality and location. They are usually described as being relative to the speaker, but in at least some cases I have found them described as being relative to either the speaker or the village, or some other not wholly speaker-focussed system. The Nimboran languages in particular have highly complex systems e.g. Wilden(1976) describes Kemtuk as having the following system: https://i.imgur.com/cYKT8xS.png, but says that it is optional. Anceaux (1965) describes 16 different spatial categories in Nimboran proper, but in a rather unhelpful manner. He notes that the unmarked position category, when the speaker is involved has a specific meaning of "near the speaker", but that it is also always used when the speakers position is indefinite or irrelevant, such as in stories or general statements. In at least some languages I have looked at, these markers were compulsory with motion verbs. A somewhat different system involving location relative to other events is described by Huisman (1973) who reports that Angaataha has a class of medial verbs which are inflected for whether they occur in the same place or in a different place as the following conjunct. As far as I can tell, none of this completely satisfies your request, but it shows that at least some things are definitely attested, and distinguish other, or more fine categories than what you've found yourself. By definition, aspect is defined in relation to the action's temporality. As such, no there is no language, natural or otherwise with "spatial aspect". However, countless languages do incorporate spatiality in verbs, whether that be in morphology or, less commonly, in the verbal paradigm. Germanic languages particles come to mind, but Nuučaan̓uł has affixes meaning, among others "at the ear", "at the side of a vessel" and "on the beach" (Advanced Language Construction, 179-180). Quechua does have (as I understand it) a mandatory directional -mu for verbs of movement. If absent, it explicitly excludes movement toward the speaker. For sure nothing prevents you from making spatiality the main category affecting verbal forms. Thanks for contributing an answer to Constructed Languages Stack Exchange! Not the answer you're looking for? Browse other questions tagged grammar tense-aspect-mood or ask your own question. What is the difference between tense and aspect? Should adjectives agree with the noun in all aspects? Are there any grammatical aspects which do not have parallels in natural languages? What are the defining traits of a Euro-centric conlang? What is the word “li” in Toki pona, grammatically? What are the aspects of Esperanto? Conlang where the initial consonants of words have meaning? What are the places where I can attach an indication of tense in relation to a conjugated verb action?